Newcastle United owner Mike Ashley has called for an extraordinary meeting of Rangers shareholders to remove chief executive Graham Wallace. Ashley, who increased his stake in Rangers International Football Club (RIFC) plc to 9% this month, also wants the removal of director Philip Nash. The board is currently "verifying that the notice is properly constituted". It states that, should it come to a vote, it will recommend that shareholders reject the motion. But, if the motion is valid, it will attempt to have the notice withdrawn "in order to avoid the cost and disruption of an ad hoc general meeting particularly given the company's forthcoming annual general meeting, further details of which will be announced in due course". Rangers announced to the Stock Exchange that they had "received a notice dated 7 October 2014 from Mike Ashley, a director of MASH Holdings Limited". "The notice states that MASH holds 4,265,000 ordinary shares of 1p each in the company, amounting to 5% of the voting rights of the company," added the statement. "MASH requires the company to call a general meeting of the shareholders of the company and to put certain resolutions to shareholders for inclusion in the business at such a general meeting of the company. "The board is united in its support of the executive team. If the notice is valid and is not withdrawn, the directors intend to recommend that shareholders vote against the proposed resolutions." Rangers promise a further announcement "shortly". The Glasgow club, who sit second in the Scottish Championship table, held an open offer to existing shareholders in September, raising £3.13m as they sought to plug a funding gap, including the repayment of loans to shareholders. 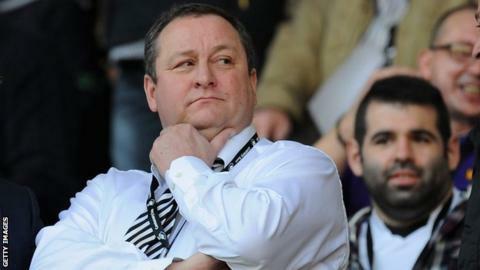 "It's no surprise that Mike Ashley has launched what an Ibrox insider tells me is a 'tactical strike' on the club. He can get his way with enough allies. The burning questions is does he have the support of the Rangers' football board chairman? With Sandy Easdale's shares and proxy votes, plus that of the Laxey hedge fund, Ashley can get to 51%. But if he does, what about Sandy's brother, James, who's on the Rangers PLC board? That's the same board that told the stock exchange it will resist Ashley's move." Isle of Man hedge fund Laxey Partners bought five million extra shares to strengthen its position as the largest shareholder (16.3%). Meanwhile, bus tycoon Sandy Easdale bought 1.2 million shares to take his personal stake to 5.21%, which means that, together with voting rights, he controls 26.15% of the club's shares. Ashley declined to buy shares in the open offer, which diluted his stake to 3.69%, but he subsequently bought 4.62 million shares, which was larger than the number he could have bought in the open offer, from investment manager Hargreave Hale, at 20p per share. It means that the sports retail entrepreneur, who holds 4% of shares personally on top of the 5% through MASH, is now the second largest shareholder in RIFC behind Laxey. Ashley, who recently insisted he will not be selling Newcastle until the end of next season at the earliest, is limited to holding no more than 10% in Rangers by an agreement with the Scottish FA. Wallace, who was previously chief operating officer at Manchester City and is also former chief financial officer with IMG and MTV Europe, became Rangers chief executive in November after predecessor Craig Mather departed following supporter protests during a period of financial turmoil. Several Rangers fans groups have protested this season about the present regime and have urged the removal of Easdale from the board. Meanwhile, South Africa-based businessman Dave King has told BBC Scotland that a newspaper report suggesting that he and other former Rangers directors are involved in a takeover is untrue. He also recently told the BBC that he had not been involved in discussions with anyone on the board.